Lawrence Power has established himself as the most sought-after violist of his generation and his sumptuous tone and persuasive interpretations have lead to many comparisons with the pioneering British violist Lionel Tertis. Indeed, the three works on this disc were written for Tertis, who did so much to broaden the instrument’s musical repertoire and raise its status to an accepted solo instrument. The two Vaughan Williams works display an unabashed romanticism and pastoral elegance. Flos Campi, meaning ‘Flower of the field’, was completed in 1925 and puzzled audiences with its ambiguous form and unusual orchestration. Despite the prominent solo viola and wordless chorus, it is neither a concerto nor a choral work. The seamless viola line moves in unity with the orchestra and the chorus appears as a body of instruments, creating an effect of mesmerizing beauty and calm. The little-performed Suite for viola and small orchestra was written ten years later and contains some of the composer’s most lyrical inventions. The lush orchestration and memorable themes in Sir John McEwen’s 1901 concerto expose this large-scale work as a neglected gem of the viola repertoire and Power’s performance is sure to set a new benchmark. The BBC National Orchestra of Wales, under the expert and unfailingly sensitive guidance of Martyn Brabbins, provides expert backing throughout. Tertis, almost single-handedly, ran an immensely successful campaign to make the viola an acceptable solo instrument in its own right and to provide it with a repertoire. With his unprecedented virtuosity and rich tone he particularly influenced the student composers at the Royal Academy of Music in the early years of the twentieth century, including Arnold Bax, Benjamin Dale and York Bowen. Tertis toured this repertoire abroad. However, Tertis’s first major commission was the Viola Concerto by the Scottish composer John Blackwood McEwen, and although this work did not generate a big following at the time it certainly drew attention to Tertis’s playing and to the possibilities inherent in the viola as a solo instrument. This was very much a Royal Academy of Music initiative, for McEwen had been a student there in 1893–5, and in 1898 had joined the Academy teaching staff after a period living in Scotland. In later years he succeeded Mackenzie as Principal of the RAM and he was knighted in 1931. McEwen and Tertis collaborated on promoting new music and young composers. McEwen’s Viola Concerto is dated 1 May 1901 and was first performed by Tertis at the RAM on 24 May with McEwen himself conducting, suggesting this was very much a collaborative Academy project at the time. The Concerto’s first public performance was on 12 December 1901 at Bournemouth, where Dan Godfrey chose it for the Bournemouth Municipal Orchestra in a Thursday afternoon concert with Tertis as soloist. McEwen was born in Hawick and studied music at Glasgow University before going on to the RAM in London. McEwen is remembered chiefly for his chamber music, including nineteen string quartets, of which the programmatic No 6, subtitled ‘Biscay’, remained longest in the repertoire. His orchestral overture Grey Galloway (the second of three ‘Border Ballads’) is still heard occasionally. His piano music includes some notably Debussian miniatures in the 5 Vignettes à la côte d’argent of 1913. Perhaps McEwen’s best-known work, at least by repute, was his programmatic Solway Symphony, which was composed in 1911 and was a prize-winning submission to the Carnegie UK Trust’s 1920s competition, which resulted in its being published in full score—receiving soon after, in 1923, a pioneering recording on acoustic 78s, the first British symphony to be recorded complete. Although given four performances by Dan Godfrey at Bournemouth this work was soon overshadowed by the symphonies of Vaughan Williams, Bax and others, and it quickly faded from the repertoire. The Viola Concerto pre-dates the influence of Impressionism on British music, but was pioneering for its presentation of the viola as soloist in a substantial three-movement work. Indeed, this is a viola concerto on the largest scale. McEwen recognizes the difficulty of projecting the solo viola above the full orchestra from the start by opening with two rousing calls to attention after each of which the viola plays unaccompanied. After a third, more extended tutti the viola is launched on an ever-extending cantilena which characterizes much of McEwen’s thematic treatment of the first movement. Each time a lyrical or reflective moment is reached the viola soon aggressively drives the music on. The viola launches into a wide-spanning tune (at 2'12'') which is immediately sung by the full orchestra after which the viola plays a lyrical pendant. The strings are then muted to accompany a new idea as the viola plays a succession of minims each followed by a decoration of upward surging semiquavers (at 3'36''), a treatment that recurs later. A notable extended lyrical episode after some ten minutes eventually leads to the quiet fade-out. The lightly scored second movement, Allegretto grazioso, with the upper strings muted throughout, charming woodwind interplay, and a lyrical trio theme for the solo viola, provides a contrast in texture and mood. This good-mannered fairy music, very much of its time, takes its cue from similar movements in Cowen’s output, music that is no longer familiar. The solo viola introduces the bustling finale, Allegro con brio, before the orchestra takes over. The soloist plays on, supported by the orchestra, before the second subject is introduced by the woodwind, accompanied by muted tremolando strings playing very softly. This idea is soon taken up by the viola, which constantly returns to fast passagework. Eventually the viola sets in motion an accelerando leading to the thistledown closing bars, the viola’s flying semiquavers punctuated by tutti chords. Ralph Vaughan Williams was born at Down Ampney, Gloucestershire, the son of a parson, and the grandson of the celebrated Judge Sir Edward Vaughan Williams, on his father’s side, and Josiah Wedgwood III on his mother’s. His father died when he was only three and consequently his formative years were spent with his mother’s family at Leith Hill Place near Dorking, the country home of the Wedgwoods. A string player—indeed a viola player—from an early age, he went to Charterhouse school when he was fifteen, later to the Royal College of Music, and then to Cambridge to read history. Subsequently he studied with Max Bruch and Maurice Ravel, so that, far from emerging from a narrow background, Vaughan Williams had one of the broadest-based educations of any British composer of his generation. Vaughan Williams took many years finding the voice by which we now recognize him, his achievement only now fully realized as his early music—finished and in many ways impressive—is played again. The appearance of the Songs of Travel and the song Linden Lea in the early 1900s signalled his growing following as a composer, while his reputation was further enhanced as a consequence of his editing The English Hymnal (published in 1906). He collected his first folksong in 1903 and his first surviving orchestral score to use such tunes came the following year: the ‘symphonic impression’ In the Fen Country. Nevertheless, some years ago an American performance of his very early five-movement Serenade in A major (1898), a work pre-dating his documented collecting of folksongs, surprised many by its folksong flavour. He was not seen as a British composer of individuality and stature much before he was forty, but with the appearance of the Fantasia on a Theme by Thomas Tallis and A Sea Symphony in 1910, and A London Symphony in 1914, that dramatically changed. It has often been noted that Vaughan Williams’s self-confessed agnosticism was ambivalent, masking a contemplative visionary sensibility. He possessed an intimate knowledge of the King James Bible and of five hundred years of English literature, including poets as varied as the Metaphysicals and the American Walt Whitman, and especially Bunyan’s The Pilgrim’s Progress. Such sources are anthologized in his many choral works, these poets providing him with a vocabulary to articulate his deeply humanitarian ethos. He drew upon two hundred years of nonconformist tradition to find unique expression in works ranging from A Sea Symphony and Five Mystical Songs to The Pilgrim’s Progress, the latter the preoccupation of a lifetime. Vaughan Williams’s Flos Campi (‘Flower of the field’) was first performed at London’s Queen’s Hall by Lionel Tertis with the Queen’s Hall Orchestra and a choir from the RCM conducted by Sir Henry Wood, on 10 October 1925. With its unusual scoring and biblical superscriptions from the ‘Song of Songs’ (the choir only vocalize to ‘ah’) it puzzled its first audience. This is one of the most original pieces in Vaughan Williams’s entire output. Not only are the forces required unusual but at the first performance the words were printed in the programme in Latin, with that unthinking intellectual arrogance that once led educated men to append quotations in classical Greek. The audience response, that this was a religious work, appalled Vaughan Williams, who remarked: ‘The quotations gave rise to the idea that the music had an ecclesiastical basis. This was not the intention of the composer.’ In fact, he had written a love song. These words have been set by many British composers, most frequently in a variety of church anthems. Yet Vaughan Williams must have been aware of Mackenzie’s oratorio The Rose of Sharon, by then superseded but in its day thought sensuous, and Bantock’s The Song of Songs, an opulent setting of the complete Biblical words, the first part of which Vaughan Williams heard at the 1922 Three Choirs Festival. Flos Campi’s six movements play continuously. The music begins with a sense of longing encapsulated in the oboe’s opening rhapsody, against which—in another key—is soon heard the solo viola. This was thought very modern when the work was new. Soon the viola sings out the glowing tune which returns in the sixth movement. There follows a pastoral interlude—the second movement—in which the viola sings a wide-spanning tune soon elaborated by the oboe. The opening oboe tune reappears in the third movement, which quietly but passionately sings of the beloved. The fourth movement provides a dramatic contrast, a march-tune celebrating the King’s search for the beloved. Vaughan Williams makes it the central pivot of his setting, much as Bantock—at much greater length—makes it the dramatic fulcrum of his. There follows the most passionate section of Flos Campi, encompassing a slow dance supported by a drum rhythm, before the soloist hints at the heart-warming tune which will signal the finale. ‘Set me as a seal upon thine heart’ is celebrated by the glorious D major melody played by the soloist. The bitonal opening of the whole work dramatically tries to return, but peace and fulfilment are achieved as the viola sings of love satisfied. It is worth paying particular attention to the choral contribution as the composer has the choir creating a variety of colours: vocalizing with open mouth (‘ah’), with lips half and ‘nearly’ closed and with mouth closed. Towards the end the choir sings with gradually closing mouths to effect a fade-out. 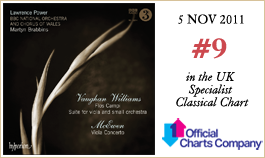 Vaughan Williams’s Suite for viola and small orchestra was written nearly ten years later, also for Lionel Tertis, who gave the first performance with the London Philharmonic Orchestra conducted by Malcolm Sargent at the Queen’s Hall on 12 November 1934. This work consists of three ‘groups’ of pieces—respectively of three, of two and again of three movements. Individual numbers have been widely played with piano accompaniment, but the complete Suite is a rarity, which is a pity because it contains some of the composer’s most mellifluous invention. The chief characteristic of Vaughan Williams’s Suite is the varied colour and lightness of the orchestration. The first movement is a Prelude in C major, the arpeggiated opening solo viola line surely a tribute to Bach (the opening C major Prelude of the ‘48’). It expands with a typical soaring lyrical treatment. A counter-melody first heard on the tutti violas leads to a pastoral middle section characterized by the opposition of the soloist in 9/8 and the orchestral accompaniment in 3/4. The arpeggiated music returns with a brief reminiscence of the pastoral theme serving as coda. The simple carol tune of the second movement is reminiscent of both the ‘Land of our birth’ tune from Vaughan Williams’s A Song of Thanksgiving of 1945 and the Woodcutter’s song from The Pilgrim’s Progress. The last movement of Group 1 is the robust ‘Christmas Dance’, alternating 3/4 and 6/8. The beefy chordal treatment of the soloist and the stamping rhythms make clear this is a rural celebration, the viola taking the place of the village fiddler. The second Group consists of only two numbers. We return to the opening tonality of C major for the ‘Ballad’, which is followed by a headlong ‘Moto perpetuo’ in C minor. The ‘Ballad’ begins in quiet mystery, with a long-spanning tune accompanied by muted strings. The intense feeling is maintained until the second half of the piece, a dancing 6/8 Allegro non troppo. The ‘Moto perpetuo’ has a galumphing country dance feel to it, the viola’s register, especially when double stopping, having a roughness that is emphasized by the changes from double to triple time. The soloist has no rest from the insistent semiquavers, and the tempo is too fast for an actual dance, the whole virtuosic invention being remarkably invigorating. In the third Group we find a string of dance tunes. After the hurly-burly of the ‘Moto perpetuo’, the singing ‘Musette’ is a lullaby, the soloist now muted and accompanied by harp and muted lower strings, with a contrasted middle section in G major. There follows a ‘Polka mélancolique’ with a syncopated middle section. Perhaps Vaughan Williams is having his little joke here for the music is neither particularly melancholy nor distinctively a polka. It is rounded by a closing section in which, as if preparing for the finale, the viola plays a succession of short cadenzas. The Allegro molto of the ‘Galop’ finds Vaughan Williams in typical scherzando mood. Les trois œuvres réunies ici furent conçues pour l’illustre Lionel Tertis (1876–1975), virtuose novateur qui domina le jeu d’alto britannique dans la première moitié du XXe siècle—il commanda maintes œuvres, instaura de nouveaux standards interprétatifs et conçut, ce faisant, un nouveau modèle d’alto. En 1899, il devint professeur-assistant d’alto à la Royal Academy of Music, tout juste deux ans avant d’être nommé professeur à part entière. Il fut choisi par Henry Wood pour le Queen’s Hall Orchestra, où il occupa d’abord un pupitre de second violon. Bientôt, le jeune chef d’orchestre l’entendit jouer l’instrument plus large et immédiatement le nomma principal altiste. Tertis demeura là jusqu’en 1904, date à laquelle il démissionna pour se consacrer au travail solo (même s’il fut brièvement tenté, cinq ans plus tard, d’accepter le poste de premier alto du Symphony Orchestra que lui proposait Beecham). Presque tout seul, Tertis mena une campagne immensément fructueuse pour faire accepter l’alto comme un instrument solo à part entière et pour lui constituer un répertoire. D’une virtuosité sans précédent, doué d’une riche sonorité, il influença particulièrement les élèves compositeurs qui fréquentèrent la Royal Academy of Music au tout début du XXe siècle, tels Arnold Bax, Benjamin Dale et York Bowen. Il emmena ce répertoire en tournée à l’étranger. La première grande commande de Tertis fut cependant le Concerto l’Écossais John Blackwood McEwen qui, s’il ne fit guère d’adeptes à l’époque, ne manqua pas d’attirer l’attention sur le jeu de son commanditaire et sur les possibilités inhérentes à l’alto en tant qu’instrument soliste. Cela ressemblait fort à une initiative de la Royal Academy of Music, où McEwen avait étudié de 1893 à 1895 et où il était revenu enseigner en 1898, après avoir vécu quelque temps en Écosse. Plus tard, il succédera à Mackenzie comme directeur de la RAM et sera fait chevalier (1931). Ensemble, Tertis et lui travaillèrent à la promotion de la musique nouvelle et des jeunes compositeurs. Daté du 1er mai 1901, le Concerto pour alto de McEwen fut créé par Tertis à la RAM le 24 mai, avec le compositeur à la baguette—ce qui corrobore l’idée d’un projet conçu en collaboration avec l’Academy. La première exécution publique se déroula le 12 décembre 1901 à Bournemouth, Dan Godfrey l’ayant choisi pour un concert que le Bournemouth Municipal Orchestra donna un jeudi après-midi, avec Tertis en soliste. Né à Hawick, McEwen étudia la musique à l’université de Glasgow puis à la RAM de Londres. On se rappelle surtout sa musique de chambre, notamment ses dix-neuf quatuors à cordes—le programmatique no 6, sous-titré «Biscay», fut celui qui resta le plus longtemps au répertoire. Son ouverture orchestrale Grey Galloway (la deuxième de ses trois «Border Ballads») est encore jouée, parfois, et son œuvre pianistique comprend, dans les 5 Vignettes à la côte d’argent (1913), des miniatures remarquablement debussystes. Sa pièce la plus connue, du moins de réputation, est peut-être sa programmatique Solway Symphony composée en 1911 et lauréate d’un concours organisé dans les années 1920 par le Carnegie UK Trust, qui déboucha sur sa publication sous forme de grande partition; peu après, en 1923, elle fut gravée sur un 78 tours acoustique, devenant la première symphonie britannique enregistrée en entier. Dan Godfrey eut beau la jouer quatre fois à Bournemouth, elle fut bientôt éclipsée par les symphonies des Vaughan Williams et autres Bax, avant de disparaître bien vite du répertoire. S’il est antérieur à l’influence de l’impressionnisme sur la musique britannique, le Concerto pour alto de McEwen innova en présentant l’alto comme soliste dans un concerto substantiel, en trois mouvements. Car il s’agit là d’un concerto pour alto à la plus grande échelle qui soit. McEwen admet combien il est difficile de projeter d’emblée l’alto solo par-dessus le grand orchestre et commence par deux vibrants appels à l’attention, après chacun desquels l’alto joue sans accompagnement. Passé un troisième tutti plus étendu, l’alto part dans une cantilène en développement continu, qui caractérise l’essentiel du traitement thématique du premier mouvement. À chaque moment lyrique ou méditatif, l’alto se met vite à pousser agressivement la musique. Il se lance dans un air ample (à 2'12''), immédiatement chanté par le grand orchestre, puis il en exécute un pendant lyrique. Les cordes sont alors mises en sourdine pour accompagner une nouvelle idée, tandis que l’alto joue une série de blanches, systématiquement suivies d’une décoration où déferlent d’ascendantes doubles croches (à 3'36'')—un traitement renouvelé par la suite. Au bout d’une dizaine de minutes, un remarquable épisode lyrique prolongé mène enfin, en douceur, à la paisible conclusion. D’instrumentation légère, le deuxième mouvement, Allegretto grazioso—aux cordes supérieures con sordini de bout en bout, avec un charmant échange entre les instruments à vent en bois et avec un lyrique thème en trio pour l’alto solo—, offre un contraste de climat et de texture. Cette musique leste, bien comme il faut et de son temps, prend modèle sur des mouvements comparables rencontrés chez Cowen—une musique que l’on ne connaît plus. L’alto solo introduit le finale animé, Allegro con brio, que l’orchestre reprend ensuite. Le soliste joue, épaulé par l’orchestre, puis les instruments à vent en bois, escortés par des cordes tremolando avec sourdines, jouant tout doucement, exposent le second sujet, bientôt repris par l’alto, qui revient constamment à des passages rapides, avant de finalement donner le branle à un accelerando menant aux vaporeuses mesures conclusives, ses lestes doubles croches étant ponctuées d’accords tutti. Ralph Vaughan Williams naquit d’un père ecclésiastique à Down Ampney, dans le Gloucestershire; il était le petit-fils de l’illustre juge Sir Edward Vaughan Williams, du côté paternel, et de Josiah Wedgwood III, du côté maternel. Ayant perdu son père à l’âge de seulement trois ans, il passa ses années formatrices dans la famille de sa mère, au domaine de Leith Hill Place, près de Dorking. Joueur d’instruments à cordes—en fait, altiste—dès l’enfance, il intégra l’école Charterhouse à quinze ans puis le Royal College of Music, avant de partir étudier l’histoire à Cambridge. Plus tard, il étudia avec Max Bruch et Maurice Ravel; loin d’émerger d’un milieu étriqué, il fut donc, de tous les compositeurs britanniques de sa génération, parmi ceux qui reçurent l’une des formations les plus larges. Vaughan Williams mit longtemps à trouver ce style ayant, pour nous, valeur de griffe, et on le comprend seulement maintenant que ses pages de jeunesse—achevées et, à bien des égards, impressionnantes—sont de nouveau jouées. Écrire ses Songs of Travel et son chant Linden Lea, parus au début des années 1900, assit son statut grandissant de compositeur, tandis qu’éditer The English Hymnal (paru en 1906) accrut sa réputation. Il recueillit son premier chant traditionnel en 1903, un an avant d’écrire son «impression symphonique» In the Fen Country, la plus ancienne partition orchestrale que nous ayons de lui et qui utilise ce genre de mélodies. Toutefois, voilà quelques années, une exécution américaine de sa toute jeune Sérénade en la majeur en cinq mouvements (1898)—une œuvre antérieure à sa collecte de chants populaires—en surprit plus d’un par sa saveur folklorisante. Jusqu’à ses quarante ans, il ne fut guère perçu comme un compositeur singulier, d’envergure, mais l’apparition de sa Fantasia on a Theme by Thomas Tallis et de A Sea Symphony, en 1910, puis de A London Symphony (en 1914) changea radicalement les choses. L’agnosticisme avoué de Vaughan Williams était, on l’a souvent souligné, ambivalent, masquant une sensibilité visionnaire, contemplative. Il était pétri d’une profonde connaissance de la King James Bible et de cinq siècles de littérature anglo-saxonne, où se côtoyaient des auteurs aussi divers que les poètes métaphysiques, l’Américain Walt Whitman et, surtout, Bunyan et son The Pilgrim’s Progress. Toutes ces sources se retrouvent dans ses nombreuses œuvres chorales, les poètes lui fournissant un vocabulaire pour traduire son éthos profondément humanitariste. Deux cents ans de tradition anticonformiste lui permirent de trouver une expression unique dans des pièces allant de A Sea Symphony et Five Mystical Songs à The Pilgrim’s Progress, l’œuvre de toute sa vie. Flos Campi («Fleur des champs») de Vaughan Williams fut créé le 10 octobre 1925, au Queen’s Hall de Londres par Lionel Tertis avec le Queen’s Hall Orchestra et un chœur du RCM dirigé par Sir Henry Wood. Avec son instrumentation inhabituelle et ses suscriptions bibliques tirées du Cantique des cantiques (le chœur ne vocalise que sur «ah»), cette œuvre, l’une des plus originales de Vaughan Williams, dérouta son premier auditoire. Non seulement les forces requises sont insolites mais, lors de la création, le programme proposa les paroles en latin, avec cette arrogance intellectuelle inconsidérée qui poussait autrefois les hommes instruits à apposer des citations en grec classique. La réaction du public, qui vit là une œuvre religieuse, choqua Vaughan Williams, qui précisa: «Les citations ont nourri l’idée que la musique avait un fond ecclésiastique. Ce n’était pas l’intention du compositeur.» En fait, il avait vraiment écrit un chant d’amour. Ces paroles, maints compositeurs britanniques les mirent en musique, le plus souvent dans divers anthems liturgiques. Vaughan Williams devait d’ailleurs connaître The Rose of Sharon de Mackenzie (un oratorio dépassé depuis mais alors jugé sensuel) et The Song of Songs de Bantock, une opulente mise en musique de tout le texte biblique, dont il entendit la première partie au Three Choirs Festival de 1922. Les six mouvements de Flos Campi sont à jouer d’une traite. La musique s’ouvre sur un sentiment d’ardent désir tout entier contenu dans la rhapsodie inaugurale au hautbois, contre laquelle l’alto solo se fait bien vite entendre, dans une autre tonalité. Ce qui fut, à l’époque, considéré comme très moderne. Bientôt, l’alto chante l’air flamboyant qu’on retrouve dans le sixième mouvement. S’ensuit un interlude pastoral—le deuxième mouvement—, où il chante une mélodie ample, bientôt développée par le hautbois. La mélodie inaugurale, au hautbois, ressurgit dans le troisième mouvement, qui chante paisiblement, mais passionnément, la bien-aimée. En un contraste saisissant, le quatrième mouvement, un air de marche, célèbre la quête du roi cherchant sa bien-aimée. Vaughan Williams en fait le pivot de son œuvre, comme Bantock l’avait fait, mais bien plus longuement, dans la sienne. Survient alors la plus fervente section de Flos Campi, avec une danse lente soutenue par un rythme tambourinant, après laquelle le soliste insinue la mélodie réconfortante qui signalera le finale. «Set me as a seal upon thine heart» est célébré par le glorieux air en ré majeur, joué par le soliste. L’ouverture bitonale de l’œuvre tente un retour théâtral, mais la paix et le contentement sont atteints quand l’alto chante l’amour satisfait. La contribution chorale mérite qu’on s’y arrête, au chœur incombant la tâche de créer toute une palette de couleurs: il vocalise à bouche ouverte («ah»), les lèvres à demi et «presque» closes, et à bouche fermée. Vers la fin, il chante à bouche de plus en plus fermée pour marquer un effacement graduel. Presque dix ans plus tard, Vaughan Williams écrivit la Suite pour alto et petit orchestre, toujours à l’intention de Lionel Tertis, qui la créa au Queen’s Hall, le 12 novembre 1934, avec le London Philharmonic Orchestra placé sous la baguette de Malcolm Sargent. Cette œuvre comprend trois «groupes» de pièces, respectivement de trois, deux et trois mouvements. On en a abondamment joué certains numéros, avec un accompagnement pianistique, mais la Suite en entier est une rareté, ce qui est dommage car elle renferme parmi les plus mélodieuses trouvailles du compositeur. Cette Suite se caractérise surtout par sa couleur variée et par la légèreté de son orchestration. Le premier mouvement est un Prélude en ut majeur, dont la ligne arpégée inaugurale, pour alto solo, est certainement un hommage à Bach (et au Prélude en ut majeur ouvrant les «48»). Il se développe avec un traitement lyrique typiquement filant. Une contre-mélodie, exposée aux altos du tutti, mène à une section médiane pastorale marquée par l’opposition du soliste à 9/8 et de l’accompagnement orchestral à 3/4. La musique arpégée revient avec une brève réminiscence du thème pastoral en guise de coda. Le simple noël du second mouvement évoque, de Vaughan Williams, l’air «Land of our birth» du Song of Thanksgiving (1945) et le chant du Bûcheron tiré de The Pilgrim’s Progress. Le dernier mouvement du Groupe 1 est la robuste «Christmas Dance», qui alterne 3/4 et 6/8. Le solide traitement en accords du soliste et les rythmes martelants disent bien qu’il s’agit d’une célébration rurale, où l’ato remplace le violoneux. Le Groupe 2 compte juste deux numéros. Nous retrouvons ut majeur pour la «Ballad», suivie d’un impétueux «Moto perpetuo» en ut mineur. La «Ballad» commence dans un paisible mystère, avec un air étiré accompagné de cordes con sordini. L’intensité ne faiblit pas jusqu’à la seconde moitié de la pièce, un dansant Allegro non troppo à 6/8. Le «Moto perpetuo» donne l’impression d’une contredanse éléphantesque, le registre de l’alto, surtout en doubles cordes, ayant une rudesse accusée par les changements de mesure (binaire à ternaire). Les insistantes doubles croches harcèlent le soliste et le tempo est trop rapide pour une vraie danse, l’invention virtuose étant des plus revigorantes. Le Groupe 3 propose une série de danses. Après le tohu-bohu du «Moto perpetuo», la chantante «Musette» est une berceuse, où le soliste joue désormais avec sourdine, escorté de la harpe et des cordes inférieures con sordini, avec une section médiane contrastée en sol majeur. Arrive ensuite une «Polka mélancolique», à la section centrale syncopée. Peut-être faut-il y voir une facétie de Vaughan Williams, la musique n’étant ni vraiment mélancolique, ni clairement une polka. Elle est flanquée d’une section conclusive où, comme pour préparer le finale, l’alto exécute une succession de courtes cadenzas. L’Allegro molto du «Galop» trouve Vaughan Williams dans sa veine bien scherzando. Tertis gelang es fast im Alleingang, der Bratsche zu dem Rang eines akzeptierten, eigenständigen Solo-Instruments zu verhelfen und entsprechendes Repertoire bereitzustellen. Mit seiner beispiellosen Virtuosität und seinem warmen Ton beeinflusste er zu Beginn des 20. Jahrhunderts insbesondere die jungen Komponisten, die an der Royal Academy of Music studierten, darunter Arnold Bax, Benjamin Dale und York Bowen. Tertis spielte dieses Repertoire dann auf seinen Konzerttourneen im Ausland. Das Solokonzert des schottischen Komponisten John Blackwood McEwen jedoch war das erste größere Werk, das Tertis in Auftrag gegeben hatte. Zwar fand es zu seiner Zeit keine große Anhängerschaft, doch machte es auf Tertis’ Spiel und das Potenzial der Bratsche als Solo-Instrument aufmerksam. Es war dies unübersehbar eine Initiative der Royal Academy of Music, denn McEwen hatte dort von 1893 bis 95 studiert und war 1898, nachdem er eine Zeitlang in Schottland gelebt hatte, zurückgekehrt, um an der Academy zu unterrichten. Später trat er die Nachfolge von Mackenzie als Direktor der Royal Academy of Music an und wurde 1931 in den Ritterstand erhoben. McEwen und Tertis setzten sich zusammen für die Förderung neuer Musik und junger Komponisten ein. Das Bratschenkonzert von McEwen ist auf den 1. Mai 1901 datiert und wurde erstmals von Tertis an der Academy am 24. Mai unter der Leitung von McEwen aufgeführt, was darauf hindeutet, dass es sich dabei um ein Gemeinschaftsprojekt der Academy handelte. Die erste öffentliche Aufführung des Konzerts fand am 12. Dezember 1901 in Bournemouth statt, wo Dan Godfrey es für ein Donnerstag-Nachmittag-Konzert des Bournemouth Municipal Orchestra ausgewählt hatte; der Solist war wiederum Tertis. McEwen war in Hawick geboren worden und studierte Musik an der Universität zu Glasgow, bevor er an die Royal Academy of Music in London ging. McEwen ist hauptsächlich für seine Kammermusik berühmt, worunter sich 19 Streichquartette befinden. Das programmatische sechste Quartett trägt den Untertitel „Biscay“ und war am längsten Teil des Repertoires. Seine Orchesterouvertüre Grey Galloway (die zweite von drei „Border Ballads“) wird heutzutage noch manchmal aufgeführt. Unter seinen Klavierwerken befinden sich mehrere bemerkenswerte Miniaturen im Stile Debussys, wie etwa die 5 Vignettes à la côte d’argent von 1913. Das vielleicht berühmteste Werk McEwens, jedenfalls was seinen Ruf angeht, war seine programmatische Solway Symphony, die 1911 entstand und eine preisgekrönte Einsendung zu dem Wettbewerb des Carnegie UK Trusts in den 1920er Jahren war. Daraufhin wurde das Werk als Partitur veröffentlicht und wenig später als erste britische Symphonie vollständig auf die damals zukunftsweisenden 78er Schellackplatten aufgenommen. Obwohl das Werk viermal von Dan Godfrey in Bournemouth aufgeführt worden war, wurde es bald von den Symphonien von Vaughan Williams, Bax und anderen in den Hintergrund gedrängt und verschwand relativ schnell aus dem Repertoire. Das Bratschenkonzert entstand bevor die britische Musik vom Impressionismus beeinflusst wurde, war jedoch insofern wegbereitend, als dass hier die Bratsche als solistisches Instrument in einem gehaltvollen, dreisätzigen Solokonzert auftritt. Tatsächlich ist dies ein sehr großangelegtes Bratschenkonzert. McEwen erkennt die Schwierigkeit, die sich ergibt, wenn eine Solobratsche gegen das gesamte Orchester antritt, und löst das Problem zu Beginn des Werks so, dass er das Orchester zwei schwungvolle Eröffnungsfiguren spielen lässt, worauf die Solobratsche jeweils ohne Begleitung folgt. Nach einem dritten und erweiterten Tutti begibt sich die Bratsche in eine sich immer weiter ausdehnende Kantilene, die einen großen Teil von McEwens thematischer Behandlung des ersten Satzes prägt. Jedes Mal, wenn ein lyrischer oder nachdenklicher Moment erreicht wird, treibt die Bratsche die Musik in recht aggressiver Weise voran. Bei 2'12'' beginnt die Bratsche eine weitgespannte Melodie, die sofort vom gesamten Orchester übernommen wird, woraufhin das Soloinstrument ein lyrisches Pendant spielt. Danach fahren die Streicher mit Dämpfern fort, um eine neue Idee zu begleiten, während die Bratsche eine Reihe von Halben spielte, auf die jeweils eine Verzierung von nach oben gerichteten Sechzehnteln (bei 3'36'') folgt—diese Methode wird später noch einmal angewendet. Eine bemerkenswerte lyrische Episode führt nach etwa zehn Minuten schließlich zu dem ruhigen, sich verlierenden Schluss. Der leicht besetzte zweite Satz, Allegretto grazioso, in dem die oberen Streicher durchweg gedämpft sind und eine anmutige Holzbläserpassage sowie ein lyrisches Trio-Thema für die Solobratsche erklingen, sorgt für einen Kontrast in Textur und Atmosphäre. Diese sehr zeittypische gesittete Feenmusik ist von ähnlichen Sätzen von Cowen inspiriert—Musik, die heutzutage nicht mehr bekannt ist. Die Solobratsche leitet das geschäftige Finale, Allegro con brio, ein, bevor das Orchester die Führung übernimmt. Das Soloinstrument spielt mit der Unterstützung des Orchesters weiter, bevor das zweite Thema von den Holzbläsern mit gedämpfter, leiser Streicherbegleitung im Tremolando eingeführt wird. Dieses Thema wird bald von der Bratsche übergenommen, die stets auf schnelle und virtuose Figurationen zurückgreift. Schließlich setzt die Bratsche ein Accelerando in Bewegung, das zu federleichten Schlusstakten leitet, in denen die fliegenden Sechzehntel der Bratsche von Tuttiakkorden durchsetzt sind. Ralph Vaughan Williams kam in Down Ampney in der englischen Grafschaft Gloucestershire als Sohn eines Pfarrers zur Welt. Er war der Enkel des berühmten Richters Sir Edward Vaughan Williams väterlicherseits und von Josiah Wedgwood III mütterlicherseits. Sein Vater verstarb, als er erst drei Jahre alt war, so dass er seine prägenden Jahre in der Familie seiner Mutter auf deren Anwesen Leith Hill Place bei Dorking verbrachte, dem Landhaus der Wedgwoods. Von jungen Jahren an ein Streicher—Bratschist sogar—, besuchte ab dem Alter von 15 Jahren die Charterhouse Schule, später das Royal College of Music in London und studierte dann in Cambridge Geschichte. Danach studierte er bei Max Bruch und Maurice Ravel, so dass Vaughan Williams unter den britischen Komponisten seiner Generation eine der umfassendsten Ausbildungen genossen hatte. Es dauerte viele Jahre, bis Vaughan Williams die Tonsprache fand, die wir heute mit ihm assoziieren. Und erst jetzt werden seine Errungenschaften ganz gewürdigt, da seine Frühwerke—die vollendet und in vielerlei Hinsicht eindrucksvoll sind—wieder gespielt werden. Mit dem Erscheinen seiner Songs of Travel und des Lieds Linden Lea zu Beginn der 1900er Jahre kündigte sich eine größere Anhängerschaft an. Sein Ruf festigte sich durch die Mitarbeit bei der Herausgabe des English Hymnal (erschienen 1906). 1903 erfasste er sein erstes Volkslied und das älteste überlieferte Orchesterwerk, in dem derartige Melodien verarbeitet waren, stammt aus dem darauffolgenden Jahr—dabei handelt es sich um die „symphonische Impression“ In the Fen Country. Dennoch sorgte vor einigen Jahren eine amerikanische Aufführung seiner sehr frühen fünfsätzigen Serenade in A-Dur (1898) aufgrund ihrer volksliedhaften Färbung für Überraschung—es ist dies ein Werk, das der Zeit, wo er bekanntermaßen Volkslieder sammelte, vorangeht. Erst ab dem Alter von vierzig Jahren wurde er als individueller britischer Komponist von Format betrachtet, der sich mit dem Erscheinen der Fantasia on a Theme by Thomas Tallis und der Sea Symphony im Jahre 1910, sowie der London Symphony 1914 entsprechende Anerkennung sicherte. Es ist von verschiedener Seite darauf hingewiesen worden, dass Vaughan Williams’ selbsterklärter Agnostizismus mehrdeutig war und wohl eine besinnliche, visionäre Empfindsamkeit maskierte. Er kannte die King James Bibel wie auch viele Werke aus 500 Jahren der englischsprachigen Literatur, darunter so unterschiedliche Schriftsteller wie die Metaphysiker, den Amerikaner Walt Whitman und insbesondere John Bunyan (The Pilgrim’s Progress) sehr genau. Diese Quellen kommen in vielen seiner Chorwerke vor, da diese Dichter ihm das Vokabular zu seinem zutiefst humanen Ethos lieferten. Er schöpfte aus einer über zwei Jahrhunderte währenden nonkonformistischen Tradition, um einen spezifischen Ausdruck zu finden, der sich in Werken wie der Sea Symphony, den Five Mystical Songs bis hin zum Pilgrim’s Progress äußerte—das Letztere beschäftigte ihn sein ganzes Leben lang. 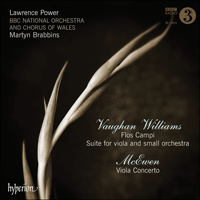 Vaughan Williams’ Flos Campi („Blume des Felds“) wurde erstmals am 10. Oktober 1925 in der Londoner Queen’s Hall von Lionel Tertis und dem Queen’s Hall Orchestra und einem Chor des Royal College of Music unter der Leitung von Sir Henry Wood aufgeführt. Die ungewöhnliche Besetzung und die biblischen Überschriften aus dem Hohelied (wobei der Chor nur auf „A“ vokalisiert) sorgten beim ersten Publikum für Verwirrung. Es ist dies eines der originellsten Werke überhaupt von Vaughan Williams. Nicht nur ist die hier vorgeschriebene Besetzung ungewöhnlich, sondern auch der Text war insofern beachtlich, als dass er im Programm (mit jener gewissen intellektuellen Arroganz, die einst gebildete Männer dazu verleitete, griechische Zitate anzufügen) auf Lateinisch abgedruckt war. Der Eindruck des Publikums, dass es sich hierbei um ein religiöses Werk handele, entsetzte Vaughan Williams, der bemerkte: „Die Zitate ließen den Eindruck entstehen, dass diese Musik eine geistliche Grundlage habe. Das war nicht die Absicht des Komponisten.“ Tatsächlich hatte er ein Liebeslied geschrieben. Dieser Text ist von vielen britischen Komponisten vertont worden, hauptsächlich in verschiedenen geistlichen Anthems. Doch muss Vaughan Williams einerseits Mackenzies Oratorium The Rose of Sharon gekannt haben (das zwar bereits überholt war, zur Zeit seiner Entstehung jedoch als sinnlich betrachtet wurde) und andererseits The Song of Songs von Bantock, eine üppige Vertonung des gesamten biblischen Texts des Hohelieds, von der Vaughan Williams den ersten Teil anlässlich des Three Choirs Festival im Jahr 1922 gehört hatte. Die sechs Sätze des Flos Campi gehen direkt ineinander über. Die Musik beginnt mit einer sehnsüchtigen rhapsodischen Anfangsfigur der Oboe, gegen die kurz darauf—in einer anderen Tonart—die Solobratsche gesetzt ist. Dies wurde, als das Werk erschien, als äußerst modern betrachtet. Bald darauf „singt“ die Bratsche die strahlende Melodie, die im sechsten Satz wiederkehrt. Dann folgt ein pastorales Zwischenspiel—der zweite Satz—in der die Bratsche eine weitgespannte Melodie hat, die kurz darauf von der Oboe verziert wird. Die Anfangsmelodie der Oboe kehrt im dritten Satz wieder, in dem leise, aber leidenschaftlich von der Geliebten gesungen wird. Im vierten Satz wird dazu ein dramatischer Kontrast durch eine Marschmelodie erzeugt, mit der die Suche des Königs nach seiner Geliebten gefeiert wird. Ebenso wie Bantock (der allerdings deutlich ausschweifender ist) macht Vaughan Williams dies zu dem Dreh- und Angelpunkt seiner Vertonung. Darauf folgt der leidenschaftlichste Abschnitt von Flos Campi: ein langsamer Tanz mit begleitendem Trommelrhythmus. Danach deutet der Solist die herzerwärmende Melodie an, die dann das Finale signalisiert. „Setze mich wie ein Siegel auf dein Herz“ wird mit der herrlichen D-Dur-Melodie gefeiert, die vom Solisten gespielt wird. Der bitonale Beginn des Werks versucht in dramatischer Weise wiederzukehren, doch werden Friede und Erfüllung erreicht, wenn die Bratsche von verwirklichter Liebe singt. Es lohnt sich, besonders auf den Chorsatz zu achten, da hier unterschiedliche Klangfarben erzeugt werden: Vokalisen auf „A“ mit offenem, halb und „fast“ geschlossenem Mund sowie Summen mit geschlossenem Mund. Am Ende singt der Chor mit sich allmählich schließendem Mund, um ein langsames Verschwinden auszudrücken. Vaughan Williams’ Suite for viola and small orchestra entstand fast zehn Jahre später, ebenfalls für Lionel Tertis, und wurde erstmals von Tertis zusammen mit dem London Philharmonic Orchestra unter der Leitung von Malcolm Sargent in der Londoner Queen’s Hall am 12. November 1934 aufgeführt. Dieses Werk besteht aus drei „Gruppen“ von Stücken—jeweils drei, zwei und dann wieder drei Sätze. Es werden relativ häufig einzelne Nummern mit Klavierbegleitung aufgeführt, die vollständige Suite ist jedoch eine Rarität, was schade ist, da sich hier mit die lieblichsten Passagen des Komponisten finden. Die Hauptcharakteristika der Suite von Vaughan Williams sind die unterschiedlichen Klangfarben und die Leichtigkeit der Orchestrierung. Der erste Satz ist ein Präludium in C-Dur, wobei die arpeggierte Anfangsmelodie der Solobratsche sicherlich eine Hommage an Bach (an das erste Präludium in C-Dur des Wohltemperierten Klaviers) ist. Es wird diese mit einer typisch emporsteigenden lyrischen Behandlung erweitert. Eine Gegenmelodie, die zunächst in den Tutti-Bratschen erklingt, leitet zu einem pastoralen Mittelteil über, der sich durch den rhythmischen Kontrast zwischen dem Soloinstrument, dessen Stimme in 9/8 steht, und der Orchesterbegleitung in 3/4 auszeichnet. Die arpeggierte Musik kehrt mit einem kurzen Anklang an das pastorale Thema zurück und fungiert als Coda. Die schlichte Liedmelodie des zweiten Satzes erinnert sowohl an die Melodie von „Land of our birth“ aus Vaughan Williams’ A Song of Thanksgiving von 1945 wie auch an das Lied des Holzfällers aus The Pilgrim’s Progress. Der letzte Satz der 1. Gruppe ist der stramme „Christmas Dance“, in dem der Rhythmus zwischen 3/4 und 6/8 wechselt. Die vierschrötigen Akkorde des Solisten und die stampfenden Rhythmen zeigen an, dass es sich hier um ein Fest auf dem Lande handelt, wobei die Bratsche an die Stelle des dörflichen Fiedlers tritt. Die zweite Gruppe besteht aus nur zwei Nummern. Wir kehren in der „Ballad“ zu der Anfangstonart C-Dur zurück, worauf ein überstürztes „Moto perpetuo“ in c-Moll folgt. Die „Ballad“ beginnt leise und geheimnisvoll mit einer weitgespannten Melodie und gedämpfter Streicherbegleitung. Diese Intensität bleibt bis zur zweiten Hälfte des Stücks, einem tänzerischen Allegro non troppo in 6/8, erhalten. Das „Moto perpetuo“ hat eine ländlich-trottende Stimmung, die sich durch die Tonlage der Bratsche einstellt, die besonders bei den Doppelgriffen eine gewisse Derbheit besitzt, was noch durch die Wechsel zwischen Zweier- und Dreiertakt betont wird. Das Soloinstrument wird von den eindringlichen Sechzehnteln sozusagen belagert und das Tempo ist zu schnell für einen richtigen Tanz—das Ganze ist in seiner Virtuosität und Originalität außergewöhnlich belebend. In der dritten Gruppe finden sich mehrere Tanzmelodien. Nach dem Rummel des „Moto perpetuo“ erklingt die sangliche „Musette“ als Wiegenlied, in der das Soloinstrument mit Dämpfer und Begleitung von Harfe und gedämpften tiefen Streichern auftritt. Darauf erklingt ein kontrastierender Mittelteil in G-Dur. Dann folgt eine „Polka mélancolique“ mit einem synkopierten Mittelteil. Vielleicht erlaubt sich Vaughan Williams hier einen kleinen Witz, da die Musik weder sonderlich melancholisch ist noch typische Züge einer Polka trägt. Sie wird mit einem Schlussteil abgerundet, in der die Bratsche, als bereite sie ein Finale vor, eine Folge von kurzen Kadenzen spielt. Das Allegro molto des „Galop“ zeigt Vaughan Williams in charakteristisch scherzhafter Stimmung.